It’s a combo you may not find anywhere else. A mountain of fries, coleslaw and whatever else you want piled between two slabs of Italian bread. It’s what made a Pittsburgh eatery known as Primanti Bros famous. Everyone in Pittsburgh and way beyond knows about the place and the sandwich. It’s been around forever. I had my very first Primanti’s ‘wich the other day. But it wasn’t in Pittsburgh. Had never gotten around to trying it there. I was at one that’s about as far away from the Steel City as you can get and sill be in Pennsylvania. This was in York, a couple hundred miles away. It’s basically in the middle of nowhere but close enough to everywhere, namely big cities like New York, Philadelphia, Baltimore and Washington. That’s why I was told it’s there, to attract homesick Pittsburghers and those in the know who live elsewhere. And if you think there aren’t that many of them, think again. Primanti’s has restaurants as far away as Sunny Florida. I was at the York Primanti’s, a New York native and Mets fan wearing a team T-shirt (neutralized by a Pirates cap), to drink in the spectacle of uprooted Pittsburgh Pirates fans watching a do-or-die battle for the World Series. Despite our geographical differences and an excruciating evening for them, it was a friendly crowd. I wrote about our encounter for the Pittsburgh Post-Gazette. Got hat for almost nothing at end-of-season sale. When in not-quite-Pittsburgh, order what else? One of those sandwiches with the famed decorations. Behold the Pitts-burger. Fries, slaw, salisbury steak and provolone. 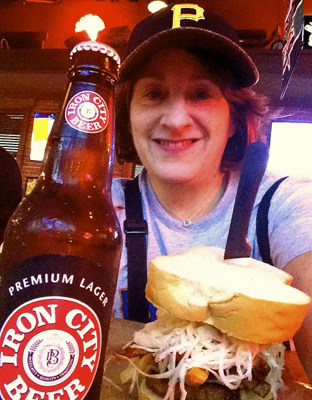 I also ordered another Pittsburgh mainstay, a bottle of Iron City beer (IC, as it’s called) for show, and a pineapple juice to actually drink. I prefer chocolate to alcohol. Got to say the sandwich, while pretty impressive, was also pretty tasteless. Including the Italian bread that everyone around me was raving about. I ended up slathering the dry lump with lots of ketchup, but was careful to steer clear of the coleslaw. Ugh. After the server cleared away my mostly untouched meal, I found out from some hometown folk that hot sauce was the ticket. Since I can’t stomach the stuff, that wouldn’t have worked. They also said it was an acquired taste. One I won’t be acquiring, ever. I should point out Primanti’s sell lots of other belly-busting grub, which comes with lots of extras, if you like. Extra meat. Extra cheese. Extra eggs. Extra indigestion. I still say you should try it if you’re ever in the Pittsburgh area. Why? Because it’s so Pittsburgh. This entry was posted in Eats and tagged baseball, food, Mets, Pittsburgh, Pittsburgh Pirates, Primanti's, sandwiches, travel, wild card game, World Series, York Pennsylvania. Bookmark the permalink.